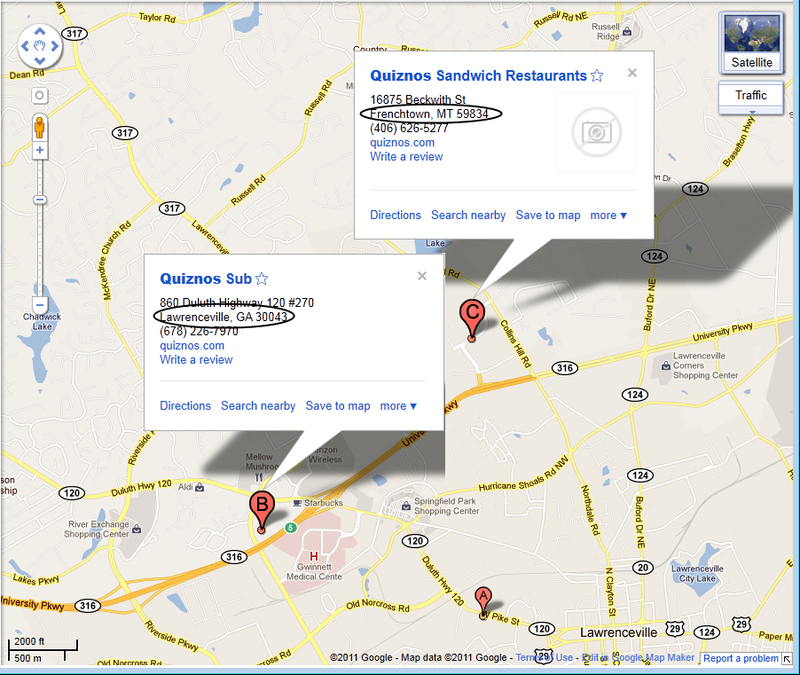 Trying to find a Quiznos and according to Google Maps there are two a couple miles apart, however their addresses are several states apart... WTF Google? While I pretty much love (or at least strongly like) Google, there are a few features that I cannot stand. Google Instant is one of them. Google's autocomplete is a little annoying, albeit a bit entertaining at times; but Google Instant drives me crazy. Every time I go to Google from a new computer (which is fairly regularly) I disable Google Instant. Disabling it is easy, just go to Preferences (http://www.google.com/preferences), scroll down about half way and select Do not use Google Instant, then save your preferences. Read entire article (a great read). I'll address that problem later (perhaps even in another post), but suffice it to say that although my Droid X reported it was on the latest and greatest Android OS, Gingerbread (AKA 4.5.596) it would often tell me there was an update available, and display the message, "Info. 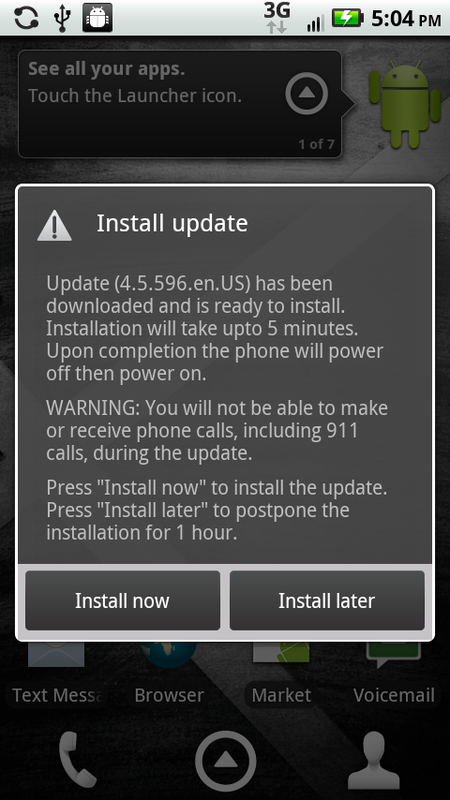 Download of update failed." This has finally gotten to me and I'm in the process of correcting it, writing this as I progress with correcting this. Here are the basic steps, then I'll expound on each. NOTE: There are a few gotcha's and things to watch out for, so please read and follow these instructions carefully. For example at various points your phone may not start or the battery won't charge, but these things are addressed in the instructions. Ever since rooting my Droid I've been using Titanium Backup Pro to backup my stuff, and it's been great. However, in my attempts to upgrade to Gingerbread, which was somewhat successful except that I lost root so I wasn't able to use Titanium Backup to do a current backup as it requires root.... If you use TB and still have root access use that to backup everything you desire and skip to step 2, otherwise keep reading. Since I couldn't use TB after losing root I got a copy of MyBackup and backed up everything, particularly the data on my phone. NOTE: make sure you do a backup and/or be prepared to lose all your data (SMS, call logs, etc.) as one of the following steps requires wiping your phone. Download and install Morotola's RSD Lite - as of this post the latest version is 4.9, which is the version I used for these instructions. The best way to find it is to do a web search for "rsd lite 4.9 download" and download from one of the file sharing sites - I didn't include a link here because 1) it may be outdated either by being removed from the download site, or a newer version of the program may be available; and 2) I don't particularly like these sites and didn't want to endorse any with a link. NOTE: I did see some references that people reported problems running RSD Lite on Windows 7 64-bit however, that's exactly what I'm using and this all worked just fine for me. Download the (FroYo) Full 2.3.340 Official SBF (filename VRZ_MB810_2.3.34_1FF_01.sbf). This thread has a link to the file I used. NOTE: Make sure your battery is full or as close as possible before proceeding as it can take a while (30 minutes or more) and the battery doesn't charge during most of these steps. Connect your Droid via USB cable. In RSD Lite select the device (Droid) and browse to the SBF file downloaded previously, then press Start. Sit back and let RSD Lite do it's thing. After RSD Lite is done the Droid will restart, however you will likely just get to the animated red Droid Eye, sit there for a couple minutes & reboot over and over again. At this point you need to wipe the phone, and since you have a good backup it shouldn't be too painful... Right.!? To wipe the phone power it off (have to pull the battery), then press and hold the home button and power button (you can let the power button go after a couple seconds, but must continue to hold the home button). This will take you to the Android system recovery utility. Next, press both up/down volume buttons at the same time to display the menu, then press the down volume button to select "wipe data/factory reset" and press the camera button. You will be presented with at least one warning that you will lose all data, but since you have it backed up you should feel pretty good about proceeding. NOTE: While in the Android system recovery utility you will also want to "wipe cache partition" as not doing so may cause your battery not to charge after completing these steps. After the phone boots you will have to follow the prompts to activate the phone with Verizon. This is perhaps the easiest part - doing a standard OTA update. 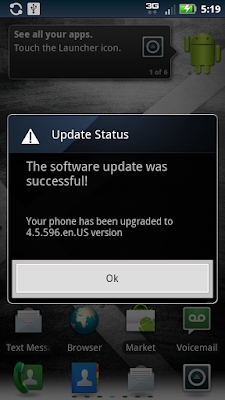 On the phone go to Setting, About Phone, System Updates and download the Gingerbread (4.5.596) update. Once downloaded install it. Go to the Android Market and install your backup software (in my case it's MyBackup), then restore your data and apps. NOTE: after the OTA update to Gingerbread my Droid wouldn't actually charge, although it said it was charging. In an earlier step I addressed wiping the cache partition - which did the trick when I had this problem previously. At this point I was a bit concerned, but a simple battery pull corrected the issue and it's working great now. Happy Androiding with Gingerbread on your Droid X.... Oh, and stay tuned as I will definitely post detailed instructions on how to remove the crapware (CityID, Blockbuster, VZ Navigator, etc.) from Gingerbread soon as I figure it out.